We are funded! cav kickstarter iii is go! Greetings All! In under the 60 hour mark, the CAV Kickstarter 3 has been FUNDED with your support! 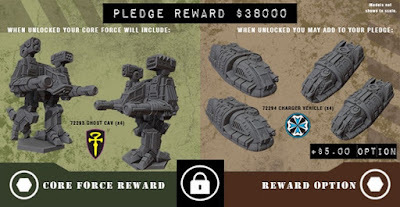 Now its time to really "kick the tires and light the fires," to open up as many stretch goals as we can! EVERY level funded from here on out will add something to the Core Force while providing even more optional Rewards that I think every backer will find something that appeals to him or her. 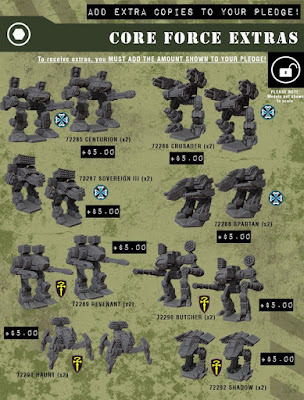 SO right now your Core Force pledge level with include these 32 CAV models, enough figures to field at LEAST three full squads for both factions. 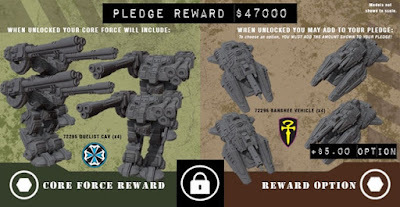 Our next goal on deck - the Ghost CAV, a Core Force reward that we will automatically add to both Ace and Dropship Pilot Pledge Levels once funded. We also have the ALL-NEW Templar Charger APC Hover Vehicle, a model that has never been produced or shown till now! Once unlocked, by adding $5 to your pledge and selecting it in the pledge manager it can be yours too! Lurking in the shadows is Stretch Goal #2! The impressive Templar Duelist and the Malvern's Banshee Anti-Grav Tank! Looking to add more Core Force models to your pledge? By adding the amount shown next to each model below to your pledge you can chose to add even more of these great models to your forces! So there you have it for now! Lets keep this campaign rolling and again, thank you for your support!